I am back. You can see why I was away on dogtiredtravelwriting. New images and posts coming soon. For the travel writing click here. Unfortunately the link to the slide show has been removed. I will have to venture how to use this blog to post the images. First 12 images are of Siracusa on the island of Ortigia. 13 & 14 were taken while on the road to and from towns. 15-35 & 37 are of Ragusa. 38-43 & 50 were taken in Noto. 36, 44-49 were all taken in the Vindicari National Park. 51-53 are also in Noto taken at night and converted to Black and White. 54-68 are of the town of Modica. 67-74 are on the roads around and in Noto Antica. 75-79 we are back in Siracusa, at the Taberna Sueva. First on the Global Restaurants to visit page here. 80-86 are all taken at our accommodation just outside Noto, Masseria Degli Ulivi. I am yet to decide what to place on my Redbubble site. Some feedback would be helpful. 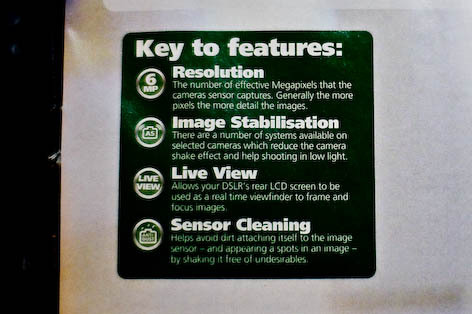 As if to justify the blog entry “Which first DSLR – August ‘08 – Thought 2 – Bells & Whistles” I found the following in Park Cameras catalogue that was an unwelcome addition to this weeks Amateur Photographer which is otherwise a brilliant magazine. Besides the Image Stabilisation, the other three were all raised as “bells and whistles”. Thanks guys. This competition was sparked by a discussion in the ‘A Photographers Craft’ forum. The idea being to photograph an apple or something similar, and use digital imagery to alter the original image. Two of the top three have been mentioned here before in the Promotion, so i will not re-introduce them. Karri is a mother with a talent for turning the everyday image into a piece of art. All three have a wealth of talent and are very deserving of their efforts in the competition. Adriana Glackins effort has some lovely texture and simple colours that bring the apple to life. Dana DiPasquales image once again emphasises the colour of the apple, with a lovely perspective and texture. Karri Klawiters use of light is exquisite. Thought No.1, and you are happy with your lens choice. Thought No.2, and you know not to fall for the gimmicks. So what then should you look for? A – Opinions differ, and so do DSLRs, so first and foremost: get what is right for you. Utmost importance to a photographer is the features and functions. Maybe you like lot of outdoor photography? A camera with a good weather sealing would be handy. You love the way your old compact can view images and capture while viewing the LCD? Then check the Live View capabilities. Do not like wading through menu’s to change functions? Check the location/functions of all buttons and dials, and the customisation capabilities of these and the menu. You love to collect things and want to be able to purchase old lenses on EBay? Check the compatibility of the lens mount. Want to make extra large poster prints? Check the pixel count versus the image quality. Want to start studio photography? Then check out the remote flash capabilities. There are many things to consider. My advice would be to narrow down what is most important to you, and go with it. The other important consideration is the handling of your camera. Get down to your local photography shop and pick the camera up. Ask if you can mount the lenses you are considering for purchase, and see how it fits and feels in your hand. Play with the menu system and function buttons to check they are in easy reach. Even consider asking if you can place the items in a camera bag and feel for weight. You may be carrying this around for a whole day. If you carry your camera around your neck, try this also. 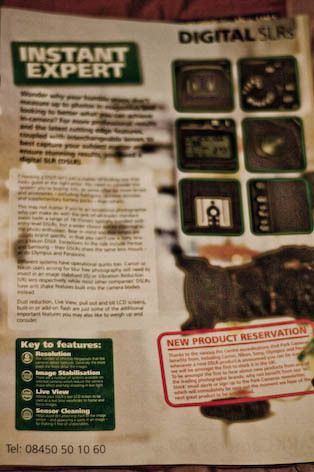 I was considering the D40 as my first camera, but decided on the D80. I felt spending a few more quid was worth it, as the D40 was a little too small for my hands. This is basic ergonomics. I knew I would be carrying the camera in my hand or on my arm most of the day and it must be comfortable. B – Important to most people is the image quality. Note: the DSLR considered to have the best image quality today, with in the next six months, and certainly one year, will be surpassed. DSLR technology is moving along at a rapid rate. When you are researching image quality, also take into account lens types used in the tests, the specified conditions of the test, and which format is being referred to. All DSLRs have RAW and JPG capabilities. RAW is the unprocessed camera information. JPG is processed in camera. When talking image quality, most commonly, noise will be discussed. Noise becomes a factor when using higher ISO speeds. Higher ISO captures more light, in turn allowing more creative control (when not using a tripod). The capability of noise reduction in today’s DSLR is moving on quite quickly. Nikon’s first full frame DSLR the D3, is a leap ahead of the rest for high ISO/low noise capability. But do not expect it to stay there for long. The sensor is said to be a Sony production, and Sony are promising a full frame camera very soon. Please note, that noise only becomes a factor when printing large images. If you do not intend to print over A4 size, do not worry about noise. Also considered in image quality is the dynamic range of the camera, its colour reproduction and the amount of chromatic aberration. Dynamic range is of considerable importance, essentially being the range of light the sensor can deal with. Colour reproduction can be dealt with; in post processing if need be, with ease. Chromatic aberration should also be considered. It is not easily to deal with in post processing. Note that these three factors are all dependant on lens type and quality. C – The camera system. When you buy a DSLR, you purchase into the manufacturers system. I touched on this in Thought 1, as most of your money will be spent on lenses. In addition to lenses are all the other bits and bobs you are likely to need at some stage like flashguns, remote cords, infra red remote, software, and so on. For example, if you do not have much to spend on software, Canon DSLRs come with free software capable of processing the RAW images from camera, compared to Nikons which is an extra £130. So consider once again the type of photography you will be undertaking most often, and research what accessories you might need. In this rapidly ever changing world, try to have some patience. (Unlike me!) Have a look at what is in the pipeline. Sometimes announcements are made about function or new technology that will be arriving in the coming months. So check and see what advances are about to be made, and consider their importance to you. An example is the Micro Four Thirds system announced by Olympus and Panasonic as noted in Thought No.2 with most useful live view to date and the smallest DSLR. Samsung has also claimed to be making a similar system, compact style DSLR, but it is not due for release until 2010. When i was about to purchase my first DSLR, I used camera magazines and also the reviews on the net by DPreview, to do my research. At this moment on DPreview, i read “Panasonic has unveiled what it is calling the World’s First Full-time Live View Digital Interchangeable Lens Camera – the Lumix DMC-G1”. There you go.